We recently asked Maureen Ogle, author of the Ambitious Brew, a series of questions. The e-mail conversation turned out to be long enough that we’ll post her answers to seven questions in three parts. First, a bit about the book. 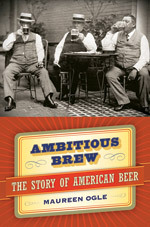 It is ambitious itself, seeking to tell the history of American beer in a different way – thus passing on Colonial history we’ve read about many times over – and starting with . . . well, that’s our first question. Those interested mostly in the American beer revolution will want to turn toward the back of the book, because Ogle tracked down the elusive Jack McAuliffe. But you should start from the beginning to understand the choices financially successful brewers made along the way, decisions that by the second half the twentieth century left America with one dominant beer style, the light lager. 1. Why start in 1840? From the perspective of someone in the brewing industry, a more logical place to start the book might have been, say, 1620 and the first colonists. But I’m a historian, not a beermaker. So I was looking for the historically significant story. And that tale – the moment when beer surpassed spirits in popularity and an industry emerged – began with the vast wave of German immigration that began in the 1840s. Had a thriving brewing industry existed in the colonial period, the book would have opened in, say, the eighteenth century. But there wasn’t and so it doesn’t. That’s not to say there wasn’t any beer. Most people brewed at home, making a low-alcohol beer that functioned as the equivalent of our safe tap water. But that’s not a particularly interesting story! In the colonial era, the story of alcohol – the historically significant story – is of rum. But even after the revolution had ended, spirits were more important than beer: In 1820, there were some 14,000 distilleries, but a mere two hundred breweries. That alone tells me where beer stood in the hearts of minds of the American people! 2. How did your academic training influence your decision to pick the topic of beer? You write the book totally changed from start to finish. How? First, were there any other histories of beer out there? If there a zillion of them, then this project was a non-starter. But the answer was no; there weren’t any other beer histories of the sort my brain was starting to fashion. So the second question kicked in: Did that mean there was no “story” to tell? Was the history of beer worth several years of my life? Off to the library, where I devoted a week or so rooting around in the few books written about beer to see if I could find a bare-bones outline of beer’s American history and, from that, determine if I could shape it into something worthwhile. Next, I spent nearly a year writing a proposal that described the book (this is the document that an agent uses to sell the book idea to a publisher). But writing a proposal of an imagined book, and writing a book based on months and months of in-depth research are two different things. My original proposal outlined a particular narrative, all based on what I thought I’d find once I began the research. But, as always happens, the research itself turned up one surprise after another and led me off in directions I could not have imagined. 3. What was hardest in doing research? Easiest: Most frustrating as a historian? Had it not been for nineteenth-century newspapers (especially the Milwaukee Sentinel and the New York Times, both of which are indexed) and trade journals such as Western Brewer and American Brewer, I’m not sure I could have written those first three chapters. It took me as long to complete them as the next five chapters combined. Things became much easier once I hit the twentieth century. Prohibition is well-documented, as is the brewers’ response to it. And for post-repeal brewing, I had all the magazines, trade journals, and newspapers I could handle. Indeed, toward the end, I almost had too much information. Plus, for the first time I was interviewing living people, and they all had plenty to say! Certainly the most frustrating part of the whole gig was A-B’s refusal to cooperate. The company historian taunted me with the fact that his vault contained hundreds and hundreds of letters written by Adolphus Busch as well as thousands of other company documents as well. I don’t even want to think about what’s in there and what I might have been able to do with it. Tomorrow: How this book is different than non-beer histories she has written, and setting misconceptions straight. Thanks for this. I was wondering about this book and it’s nice to read from her perspective! I’m halfway through the book and find it a very good read. Good job Maureen!